(3802, W. P. Campbell Collection, OHS). (15637, Ruth Mohler Collection, OHS). The Osage are an American Indian tribe whose ancestral domain included much of Oklahoma. A legend indicates the Osage and the other Dhegiha Sioux (Kaw, Omaha, Ponca, and Quapaw) originated at Indian Knoll near the mouth of the Green River in Kentucky. However, in paleolithic times they ranged from the fork of the Ohio River to the Mississippi and beyond. Osage genesis myths and archaeological evidence tend to support the legend. The Osage Bear Clan version of creation has the four winds gathering the flood waters of the earth and draining the water in great rivers. This place was called Ni-U-Kon-Ska or the Middle Waters. Today this is the junction of the Missouri, Mississippi, Ohio, Tennessee, Wabash, Arkansas, and Illinois drainage systems. From this the Osage took their real name, Ni-U-Kon-Ska or People of the Middle Waters. By A.D. 1200 both the Osage and the invading Iroquois left the "dark and bloody" ground of Kentucky. Bits and pieces of evidence indicate there were probably three routes of Osage immigration into the trans-Mississippi West. A fragmentary cluster of small groups followed the White River to Arkansas, Missouri, and eastern Oklahoma. The largest core cluster of bands took the Missouri-Osage River route to west central Missouri. A group of six sizable bands followed their Iowa, Otoe, and Missouria cousins to the Oneota River in Iowa. After a short stay the six bands of Osage went south to the mouth of the Osage River. After a decade they went upstream to the bend of the Missouri River opposite the mouth of the Grand River. In 1777 three of the Osage bands joined the main group on the Osage River. 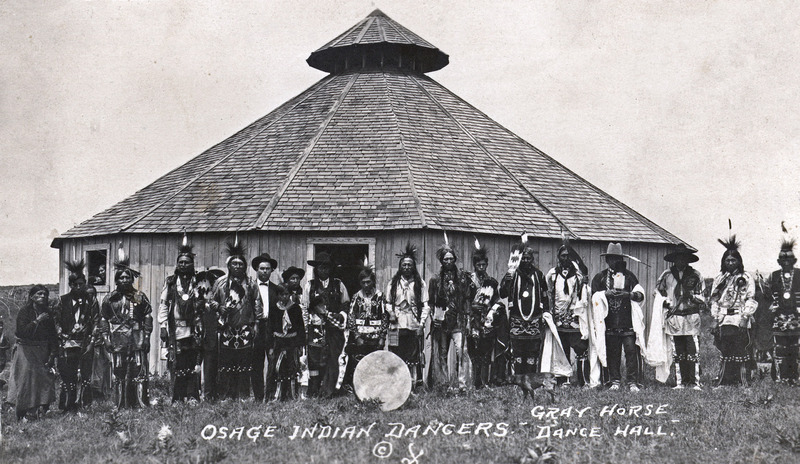 During the move to reach their historic locations all of the bands kept close contact with their clans and gentile system, which acted as the bond holding the Osage together as a people. In the long war to stop the Iroquois' movement from the Northeast to the Old Southwest that is now Kentucky, the Osage had formed an alliance with the Illinois. Two of the Illinois clans had merged with the Osage on the Oneota. Both this merger and the long Kentucky war had revolutionized Osage government and their military organization. Thus, it was natural for them to launch into a territorial war for control of the prairie-plains. The Caddo speakers who were native to the area were basically a peace-loving people, as the Osage had once been. Like the Osage, they were forced to become warlike in the face of the Osage invasion. However, by 1750 the Osage had established control over half or more of Missouri, Arkansas, Oklahoma, and Kansas. About 1750 the Osage took the westernmost French outpost from the French. This was Ferdinandina on the Arkansas River, now under the waters of the Kaw Reservoir. By 1790 they were raiding near Santa Fe. According to one account they explored as far west as the Palos Verdes Peninsula on the Pacific coast of California before 1800. Spanish governmental communications from New Mexico and Texas clearly show a well-established Osage presence in Oklahoma by 1750. With the transfer of the French claim to Louisiana to Spain in 1763 the Spanish found they could not dominate or control the Osage. One of the largest Osage bands in Oklahoma before 1800 was the Black Dog band. The Black Dog Trail from Baxter Springs, Kansas, to beyond the 100th Meridian was the first improved road in both Oklahoma and Kansas. With ramped ford approaches and cleared of all trees, brush, and large rocks, it could accommodate eight horsemen riding abreast. In 1803 Black Dog moved to Ho-tsa-Tun-ka (Big Cedar), now Claremore, Oklahoma. Ka-se-gra (Tracks Far Away) who was usually called Big Track, had already established the core Oklahoma bands at Three Forks some years earlier. Claremore or Town Maker moved this group to near present Claremore at Claremore Mound. This village was called the Place of the Oaks. A third large band of Osages in Oklahoma before 1800 were the Grosse Cotes, or Big Hills, near Nowata. Possibly over a thousand or more other Osages resided in Oklahoma before 1800 in small villages. Osage village and campsites were favored places for later settlements; the sites were cleared and lay within the network of Osage trails that became the highways of today. To end Osage-Cherokee hostilities the U.S. government forced all Osage bands to remove from Arkansas and Oklahoma in 1839. These bands were relocated on the Verdigris River in the Kansas part of Indian Territory where the Missouri Osage had agreed to settle in 1825. Thus, removal back to Oklahoma from Kansas in 1871 was the third displacement within forty-six years. The previous removals were bad, but the 1871 expulsion was worse in terms of lives lost and hardships. This move almost destroyed the Osage people. Old tombstones indicate the greatest toll was among young mothers and infants. Yet the old people who made the move never spoke of the deaths and sorrows. The Osage economy relied upon hunting and gathering, but they had a sizable agriculture and an extensive trading system. Grazing became economically important in the 1890s. Income mainly from grazing leases caused the commissioner of Indian affairs to call the Osages "the richest people on earth." Petroleum income did not become a monetary factor until after Osage allotment in 1906–1907. By the 1920s the commissioner's comment had come closer to the truth. Osage grass-leasing regulations made an easy transfer from grass to oil leasing. "Black Gold" became a national term when an Osage-bred, -trained, and -owned race horse by that name won the Kentucky Derby in 1924. Allotment brought a division of the Osage Trust Estate. This financial estate came from treaty settlements, land sales from the Kansas Reservation, and accumulated interest on money held in trust by the United States. This was distributed to each living Osage and amounted to a little more than ten thousand dollars each. Income from grass and mineral leases were distributed quarterly on a per capita basis to those who had been living in 1907. In addition, each headright holder, that is, one entitled to an equal share of the tribe's mineral interests, was allotted just over 640 acres in Osage County, Oklahoma. Unlike other reservation allotments in Oklahoma, there were no surplus lands after Osage allotment. The Osage had purchased their reservation and owned it in fee simple. Osage County never came under the Homestead Act of 1862. Osage prosperity attracted money-hungry outsiders. The so-called Reign of Terror, in which a number of Osage were murdered for their petroleum wealth, ended only when the newly formed Federal Bureau of Investigation (FBI) won a conviction in federal courts. The Osage Murders was the FBI's first homicide case. The economic depression of the 1930s made the Osage once again poor, but happier. Since then, stereotypes and exaggerated stories about rich Indians and books about the murders have held the center stage in Osage-related literature. As a result, little has been said about the majority of the Osage people, who were busy giving their children the best education money could buy, who worked hard to produce beef for American tables, who firmly backed their state and nation in both war and peace. Notable Osages include John Joseph Mathews, Gen. Clarence Tinker, Maria and Marjorie Tallchief, and Bacon Rind. The Osage allotment is full of firsts. Separation of mineral rights from surface rights by federal law first occurred in the Osage oil fields. Most Oklahoma history texts mention that the Constitutional Convention of 1907 had delegates from Oklahoma Territory and Indian Territory but neglect to note that the Osage Tribe also had two convention delegates. Although they were not U.S. citizens during World War I, Osage men accepted the draft and volunteered for service in the highest percentage of any ethnic group of U.S. citizens. This was repeated during World War II. A new current of vitality enlivens the fifteen thousand Osage people since the turn of the twenty-first century. More than ever before, Osages hold graduate degrees. Language and craft classes are held throughout the year at several locations, including the Osage Tribal Museum in Pawhuska and the White Hair Memorial, an Oklahoma Historical Society facility near Ralston. Most of the old Osages have died (four of the original 2,229 Osage allottees survived in October 2003), which means that a new generation now leads the people. A new tribal life began with the new generations. Louis F. Burns, Osage Indian Customs and Myths (Fallbrook, Calif.: Ciga Press, 1984). Paul Wallace Gates, Fifty Million Acres: Conflicts over Kansas Land Policy, 1854–1890 (New York: Arno Press, 1979). W. W. Graves, The First Protestant Osage Missions, 1820–1837 (Oswego, Kans. : Carpenter Press, 1949). Francis La Flesche, The Osages and the Invisible World: From the Works of Francis LaFlesche, ed. Garrick Bailey (Norman: University of Oklahoma Press, 1995). Abraham Phineas Nasatir, Before Lewis and Clark, 2 vols. (Lincoln: University of Nebraska Press, 1990). Tillie Karns Newman, The Black Dog Trail: A Story of the Osage (Boston: Christopher Publishing House, 1957). 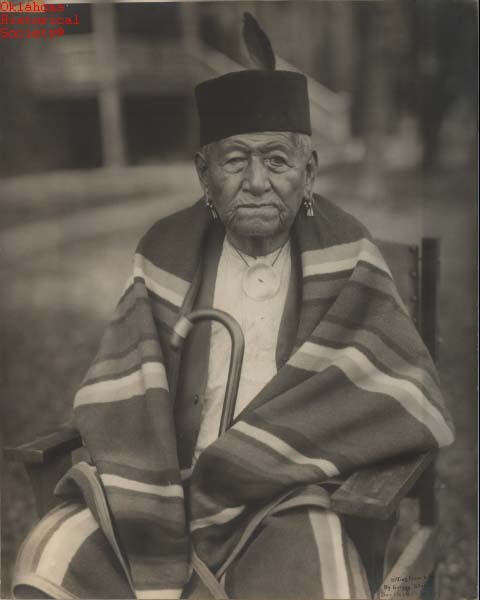 Louis F. Burns, "Osage (tribe)," The Encyclopedia of Oklahoma History and Culture, https://www.okhistory.org/publications/enc/entry.php?entry=OS001.